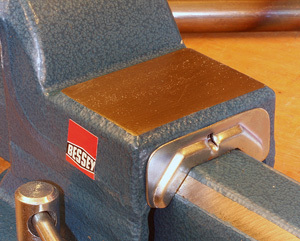 We expect a vise to be tough and nobody makes them tougher, or more accurate than Bessey. Lots of people make vises and about as many call them “industrial” in one way or another. But when a world leader like Bessey applies that term you can depend on it meaning what it is supposed to. Bessey is one of very few manufacturers that designs and produces their own steels and has many decades of industry expertise in the manufacture of their vises. 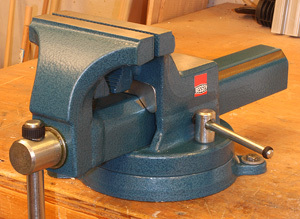 The brand new (3-2013) Bessey 4” Industrial Bench Vise shown here is an example of this line of work-holding powerhouses. The vises in this line are made in Europe from tough 90,000-PSI drop forged alloy steel. Bessey is so sure of the toughness of these vises they guarantee them against breakage in normal use. The Bessey 4” Industrial Bench Vise (#BV-DF4SB) shown here has 4”-wide jaws that open to 4-1/4”. The throat depth is 2-3/8” and the integral pipe-gripping jaws accommodate pipe from 3/8” to 1-1/4” in diameter. They also offer the #BV-DF5SB which has a 5” jaw width, 6-1/2” opening, 3” throat and 3/8” to 1-1/2” pipe capacity. The #BV-6SB with a 6” jaw width, 7” opening, 4” depth and 3/8” to 2-1/2” pipe capacity is the largest available in this model vise. The Bessey 4” Industrial Bench Vise has a 360-degree swivel base that lets you put the secured work where you need it for efficiency and safety. The operating screw and handle are oversized to insure smooth operation while making applying the pressure needed a low strain event for the operator. 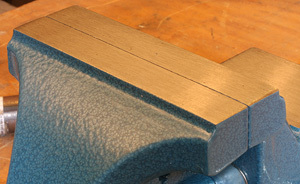 The jaws (left) match up so closely because of the beveled guide system Bessey developed. There is an adjustable shoe (right) and two large hex adjust screws on the side of the vise shold wear become an issue many years down the road. The arm of the moving jaw has beveled upper edges forming what Bessey calls V-guides. 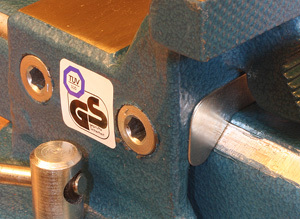 Those V-guides interact with an adjustable “shoe” within the body of the vise. That system keeps the moving jaw aligned with the fixed side throughout its travel so pressure is applied evenly to whatever is put in them. A pair of large hex screws on the side of the body provide adjustment of the shoe to V-guide clearance so you can restore the tracking should wear become an issue many years down the road. The pipe jaws are located just below the flat jaw surfaces. Their serrated surfaces get a good grip on pipe materials to hold fast during common cutting and threading operations. Also, just behind the fixed jaw is a 2-7/8” by 2” ground anvil surface. One of the hallmarks of a great vise is that it works whenever you need it without issues or drama. The Bessey 4” Industrial Bench Vise appears to be over built but I have come to expect that kind of robust design from Bessey. A vise is a tool we expect to function for a long time in a tough environment so Bessey designs in the mass and quality materials to insure that lifespan. Installing the Bessey 4” Industrial Bench Vise means installing three fasteners appropriate for the application through the holes in the base to secure it to your bench. Then insert the handle and push on the rubber end, a feature you will like should you ever want to remove the handle in the future. One hint I can give is to warm this rubber ring before trying to put it on. Body temperature is sufficient just don’t waste your time if the ring is very cold. 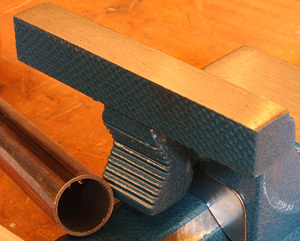 Both the flat and pipe jaws (left) get a good grip without tearing up the surface of the metal. and yes, there is an anvil (right) just behind the fixed jaw. The remarkable fit of the moving jaw assembly with its beveled upper edges becomes evident whenever you close the jaws. The top and side surfaces are nearly perfectly aligned every time which makes many bending and other gripping jobs more accurate and secure. The crosshatch pattern on the jaw faces does a good job of getting a grip on most material types without causing extensive damage. The pipe jaws located below the straight faces are serrated but only enough to get a firm grip. As long as the operator doesn’t get carried away with excess pressure you can grip pipe sufficiently to cut, grind or drill without tearing up the pipes surface. Just in case you really do want to crush something the 10-1/2”-long handle and smooth-running threading on the operating screw will provide plenty of power. For more real-world tasks the clamping power needed is easily attained with the Bessey 4” Industrial Bench Vise. In most home-based or shop environments the Bessey 4” Industrial Bench Vise exceeds your needs and then some. The Bessey 4” Industrial Bench Vise is a well-made, solid vise with unique design features that make it more user friendly and efficient in the shop environment. Both the high quality steels and durability-inducing drop forging process insure that the Bessey 4” Industrial Bench Vise will continue to perform like new for a very long time to come. At this writing (3-11-2013) the Bessey 4” Industrial Bench Vise is still making its way into widespread distribution and the actual street price is yet to be established. However it carries a MSRP of $366.45 and we can expect the street price to come in under that if the market holds true. That means that the Bessey 4” Industrial Bench Vise can become a trusted fixture of your shop without killing the budget.